After extensive research, testing, and development, we are pleased to announce the all new AyrMesh Hub2x2. MIMO is a technology that allows a WiFi access point (like the AyrMesh Hubs) to use multiple antennas that receive and transmit multiple “spatial streams” of data simultaneously. 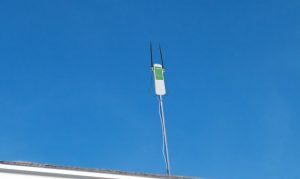 Multiple antennas also help make the signal more readily available in difficult places like in trees and around buildings. The use of MIMO represents a new strategy for AyrMesh Hubs. Previous AyrMesh Hubs traded off bandwidth to achieve maximum range. The Hub2x2 combines outstanding bandwidth and excellent range to normal WIFI-enabled devices, with a small sacrifice in Hub-to-Hub range. The reason for this tradeoff is that we have found that most of our customers have their Hubs within a mile of each other, and are primarily interested in ensuring good WiFi coverage with excellent speed around their home, pool, gardens, farm office, workshop, barns, chicken coops, and stables. The new Ayrmesh Hub2x2 is designed specifically for those needs while still enabling you to expand your AyrMesh network out into fields and across thousands of acres. The AyrMesh Hub2x2 is a perfect Gateway Hub for almost any AyrMesh network, because it provides long range and high bandwidth. 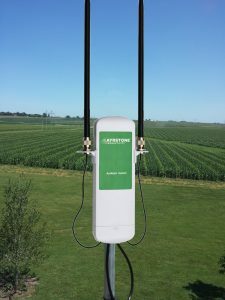 The Hub2x2 is also a great Remote Hub up to a mile away, making it an excellent product for providing high-bandwidth WiFi around a rural home, farm, or estate. By placing Hubs a mile or less apart, you can ensure a continuous “cloud” of WiFi for your devices. For Remote Hub installations more than a mile away, we recommend using the Hub2T. Its single antenna “focuses” its signal much more for longer-range applications, which provides better bandwidth at those distances than the Hub2x2. The only time we will recommend the Hub2T as a Gateway Hub is when a Remote Hub will be positioned over 2 miles away from the Gateway. In this case, the Hub2T will provide better bandwidth to the Remote Hub2T than the Hub2x2 would. One other point: the Hub2T has MUCH lower power requirements than the Hub2x2, so it is more suitable for solar/wind powered installations. 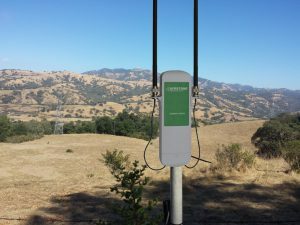 This entry was posted in AgTech, Ayrstone Products, Cameras, Farm Networking, Farm Security, Technology and tagged agtech, ayrmesh, ayrstone, farm network, farm wifi, hub, hub2x2, internet, networking, wifi, wireless, wireless farm network on July 6, 2018 by billmoffitt. Move your Ag Data! AGBRIDGE and Ayrstone team up.